I am seeking admission with a full scholarship. Does the IESC have a scholarship scheme for highly competitive applicants? A1. Currently the IESC does not. The IESC is a non-funded programme in principle, which means applicants themselves are responsible (either privately or by independently securing a scholarship) for the school fees and all other expenses required to live and study in Kyoto. Where can I find scholarship information to enable me do my Master’s in the IESC at Kyoto? A2. Please see the university’s web site . I would like to apply for a MEXT full scholarship to do my Master’s in the IESC. Where should I start? A3. Please contact the Japanese Embassy/Consulate-General in your country to ask for application information. The application deadline and screening timetable vary from country to country. Are there any possibilities that I can apply for the MEXT through Kyoto University before I am enrolled in the IESC? A4. There currently is no MEXT scholarship that you can apply for and secure prior to enrolment. There will be a few MEXT application opportunities after you start your study at Kyoto while its selection is highly competitive. When and how do I have to certify my financial ability and/or scholarship award? A5. Financial declaration forms (Form D and E) must be completed and signed by your sponsor and/or yourself as a part of our formal admission procedure if you accept our admission offer and intend to enroll in the IESC. Are there any opportunities for scholarship application after I am enrolled in the IESC? A6. Yes, privately-funded students will have opportunities to apply for scholarship/grant programmes organized by various sectors through the GSES. The selection process is on a competitive basis. Please note that the majority of scholarships are for the students who already have started the course at Kyoto and only a few scholarships are open to applications from candidates before enrolment. What do the fees consist of? A7. The school fees consist of an Admission (Matriculation) fee and Tuition fees. The Admission (Matriculation) fee must be paid prior to enrolment. This is a one-time, non-refundable fee and the payment of the admission fee allows us to issue an official admission confirmation letter. Tuition, on the other hand, is to be paid either each term or in a single installment for each academic year starting in April, after enrolment. For more information on KU school fees, please see the university’s web site . Is an admission fee waiver available for applicants? A8. Yes, There is also admission fee waiver programme for those who are suffering a major, unexpected financial hardship. The application becomes available after the announcement of the final admission results and there are a few important notes for international applicants on terms and conditions. Please contact the office for the details. .
Can I apply for a tuition waiver? A9. Yes. There is a typical half exemption and a full exemption of tuition fees based on the university’s evaluation. Tuition waiver is awarded each, therefore a waiver application must be made each term. Application is open to all Kyoto University students in any year if they are having a financial difficulty with the payment of tuition fee. How and when do I have to pay a tuition? A10. Unless you have applied for a tuition waiver programme and are waiting for the result, you will receive the invoice in mid April for Spring Semester (Semester I), and in mid October for Fall Semester (Semester II). You have to deposit the amount by domestic bank transfer using the bank transfer request form enclosed by the payment due date. Can I email PDFs to the GSES Office instead of sending the paper by post? A11. No. We only accept applications by postal mail if you choose postal application method. However, it is recommended to let the office know of your application and send PDF files as a back-up along with the post. We are now accepting applications via our online application system as an alternative to postal applications. Will the application documents be returned after selection processes? A12. No. None of the application documents will be returned to the applicant – regardless of the admission results. Must all academic transcripts/diplomas/FEL test certificates be original? Do you accept photocopies of these? A13. No. We accept either original documents or officially verified copies (issued and certified by the university or institution), but not straight photocopies. Please consult the GSES office in advance if you have any difficulties with submitting originals or verified copies. I have been educated in English at school and university and am a competent English user, although it is not my first/native language and I am not from majority English speaking country such as US, UK etc. Do I have to submit a TOEFL or IELTS score report taken within the last 24 months by direct mailing from ETS/The British Council? A14. Yes. If you have difficulties submitting any of these test certificates, please consult the GSES office in advance, specifying your circumstances. Could the application fee (10,000JPY) be waived or refunded because of financial difficulty and/or academic distinction? A15. There currently is no application fee waiver or refund. The only exception is the applicants for the MEXT scholarship via embassy recommendations who have passed the final screening at the ministry. Do I have to find my prospective supervisor/academic advisor for my Master’s at Kyoto? Must I contact a faculty member before I apply? A16a. Applicants for the IESC do not have to find a prospective supervisor themselves, but they must specify the study field/research group of their interest. Therefore, prior contact with the relevant faculty member(s) is not mandatory. This does not mean that you may not contact them if you, of course, have any queries. How can I contact the faculty members of the laboratory of my interest? A16b. Please find the contact emails of the laboratories involved in the IESC in the document ‘Preferred backgrounds and existing knowledge)’ . I understand I can choose maximum three laboratories of my interest on Form A, but what if I write only my first choice? I am very keen on being assigned to a specific laboratory or supervisor, who I already have contacted. A17. Due to the capacity of each laboratory, applicants simply would have more chance to be admitted to the degree programme by nominating three laboratories than by leaving the second and third choices blank. Should I ask the referees to use the designated form (Form C)? Can they provide a reference in a letter format? A18a. Please ask them to use the form. If they would rather provide a written recommendation, please ask them to enclose it along with the Form C.
Q18b. 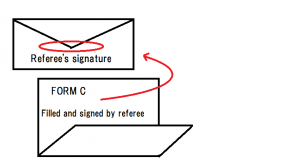 Reference form (Form C) – sealed and signed? How should I submit the reference forms? What is ‘sealed and signed’? A18b. Reference forms must be sealed and signed (please see the picture). 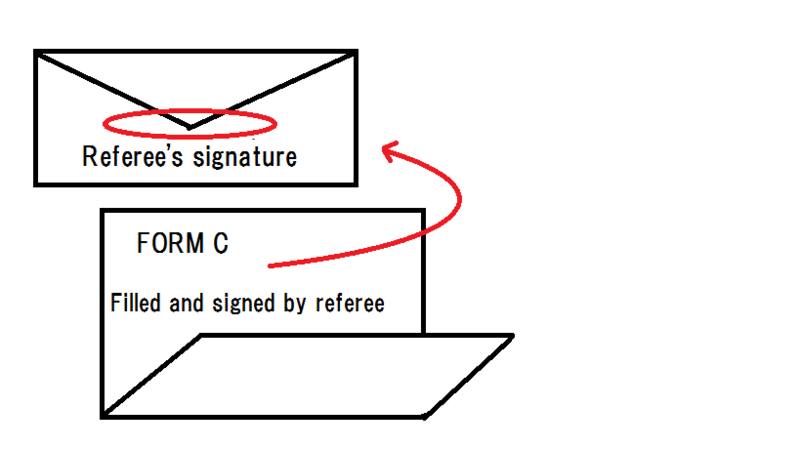 We do not accept the reference forms that are NOT sealed and signed by the referee. What is “identification confirmation procedure”? A19. The Admissions Committee may ask the applicants who will be interviewed on telephone or internet for their online/video identification confirmation before the interview. Applicants themselves must attend this session. Overseas applicants, therefore, are requested to secure the environment with excellent internet connection and a PC/Mac with a web camera. Kyoto University has “Admissions Assistance Office ” for applicants to the university from China. I am a graduate/student of a Chinese University and do I have to apply to the AAO first, or should I directly send my application documents to the IESC Administration at the Graduate School of Energy Science? A20. As far as the admissions to the IESC’s master’s and doctoral programmes concerned, you can send application documents directly to the office of the Graduate School of Energy Science as instructed in our application guide. Applicants documents will be forwarded from the GSES administration office to the AAO for review when and where appropriate. This does not apply to any other courses in the GSES. Can a “Kenkyusei” student, i.e. a’ research’ student with non-degree status of Kyoto University, apply for the IESC? A21. Prospective students are NOT required to be a Kenkyusei prior to enrolment for the admission to the IESC. Current Kenkyusei can apply for the IESC, however, being a Kenkyusei of the GSES or other graduate school of Kyoto does not advantage the application or the choice of laboratories in IESC admissions. Can I apply for a deferred enrolment for my national service at home or other reasons? A22. Unfortunately we are currently not ready for accepting the deferment of enrolment. Do you process applications on a rolling basis? A23. No, we have a fixed application deadline and application must be made by no later than the deadline specified in each course and enrolment cycle. According to the GSES web site, you have “International Doctoral Program (IDP)” with MEXT scholarship. What are the differences between the IESC doctoral program and the IDP? Which should I apply for? A24. The “International Doctoral Program” is one of the MEXT’s Priority Graduate Programs (PGP) , in which a full MEXT scholarship is offered to successful candidates if they satisfy the MEXT eligibility. The IESC is NOT a PGP. Please also see Q1. I am applying for a MEXT scholarship via Embassy’s recommendation (postgraduate) and interested in enrolling in the IESC Master’s program as a MEXT student. How and when should I apply for the IESC? A25. You have to organize two different applications yourself, scholarship (MEXT) and postgraduate degree program (IESC) . MEXT and IESC application processes are independent from each other. An informal consent and/or support from a prospective supervisor are not required and will neither advantage nor bias the application in IESC admissions. Do you have any halls of residence for international students at Kyoto? A26. Yes, we do. We have four university international houses- Shugakuin, Uji, Ohbaku and Misasagi for newly arrived international students. Application must be made via the GSES office and your prospective supervisor after you officially accept our admission offer. There will be a random selection draw and stay period restrictions (typically 6 months) due to the limited number of rooms available. Overseas students who already have lived in Japan for one year or more cannot apply for this accommodation..
Where does the IESC take place? A27. IESC’s coursework takes place mainly at the Yoshida Main Campus, Kyoto. The GSES’s laboratories/ faculty members’ offices are located across the Yoshida Main Campus, Uji Campus and Kumatori RRI (Reactor Research Institute), where laboratory seminars, thesis tutorials, and experiments (if relevant) happen. As a degree course taught in English, do I need no Japanese language to enroll in the IESC at Kyoto? A28. Yes and no. The IESC students will be taught in English, receive academic supervision and write their thesis in English, therefore, no knowledge of Japanese language is required for this course. However, we recommend that students learn some basic Japanese, as this is essential for anyone who lives in Japan to communicate with people both on and off campus. The university provides international students free in-session Japanese language courses at the International Centre for different levels of experience. What is the living costs for an international student at Kyoto? A29. Living expenses vary depending on the length of the course and students’ lifestyles. For the average living costs, please see the university’s and JASSO’s web sites .